Biomass Fired Thermal Oil Boiler uses clean energy as fuel, with the characteristics of low pollution, low emission high efficiency, energy saving. 1. Low steel consumption, high air leakage efficient, high Biomass leakage volume, suitable to burn I II soft coal also. 2. Adoption of automatic temperature control function is made to achieve stable heating and precise temperature adjustment. 3. It adopts perfect running control and safety monitoring device with safety,reliability and easy operation. 4. Fast temperature rise,high thermal efficiency, with overload capacity at a certain degree to ensure output of boiler. 5. The heating surface adopts closely packed tubes, having adequate heating surface, reducing the heat load of the tube surface, high thermal efficiency, and more secure. 6. Adiabatic combustion of fuel in the combustion chamber, easier ignition and more complete combustion to improve the thermal efficiency of the boiler. 7. 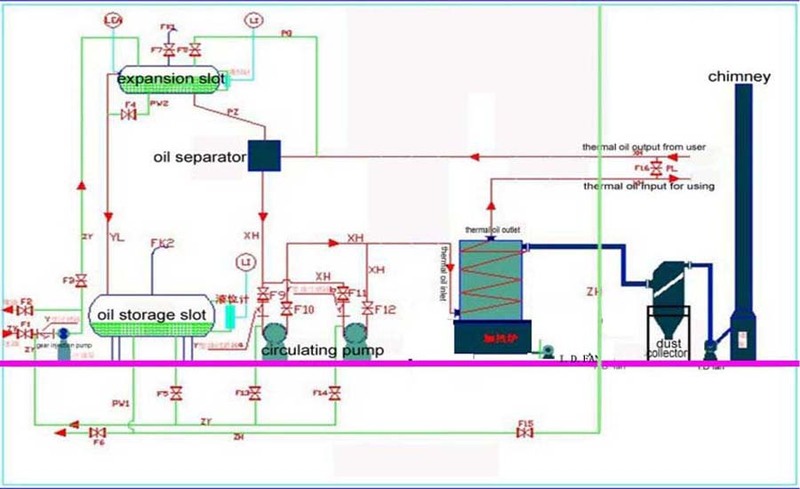 Reasonable medium flow, oil flows from low inlet to high outlet; gas produced during oil flow is difficult to keep in the boiler to avoid hidden danger. 8. Closely-packed coil tube on boiler roof to better protection boiler roof and void its burnout. 9. Easy installation, no foundation; just need to close the upper body and the lower grate, short installation period.